The new year is upon us and I’m ready to start a serious healthy kick for our whole family. I’m joining Slimming World next week and am keen to find foods that are on plan but also suitable for the whole family. One of my biggest challenges is eating less bread. I love bread! 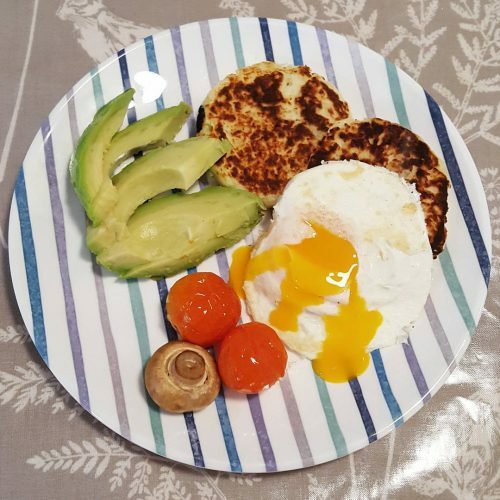 I wanted to find an alternative that would satisfy my need for carbs and potato cakes are what I came up with! Harry really enjoyed them and they filled us both up until dinner time! Boil the potatoes until fully cooked. Drain and leave to steam in the colander for a couple of minutes. In the pan you cooked the potatoes in, add the onion and garlic, cook gently while the potatoes steam then return the potatoes to the pan. Add the cream cheese and egg then mash until smooth. Spoon tablespoonfuls of the mixture into a non stick frying pan, in a little fry light, on a medium heat. Allow to cook for 2-3 minutes on each side, until golden in colour. Serve with whatever you fancy! We had ours with a fried egg, mushrooms, tomato and avocado. Harry really enjoyed it and so did I so I think this will become a regular breakfast or lunch for us! This made a batch of 12 potato cakes. They can be frozen then defrosted in the microwave and crisped up again in the oven. Is there anything else you could use instead of cream cheese to make these dairy free? Do you think mayo would work?